McCarthy Volunteer Fire Dept. Truck | Real Art Is Better! A print of this painting is available at my online shop. The original sold. Monday this week, I went down to mail at the airport in McCarthy, Alaska. 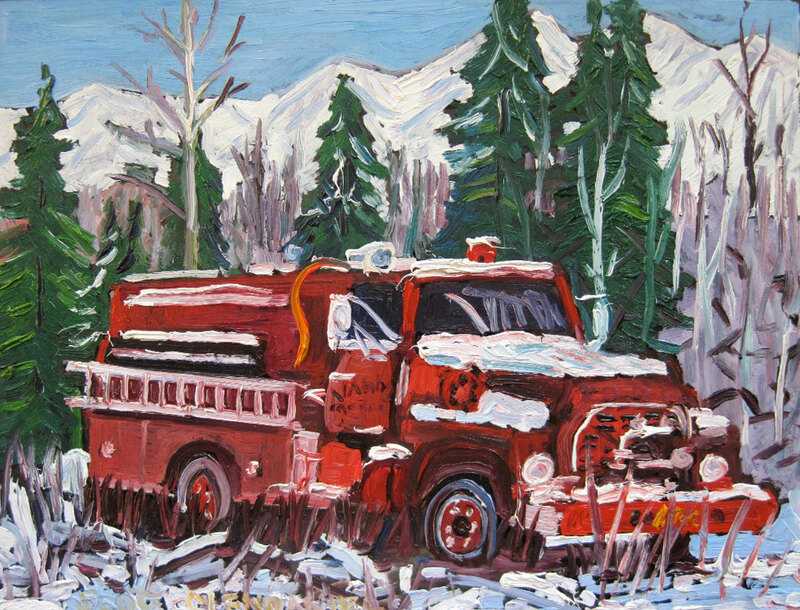 I had planned on making this painting of the volunteer fire department truck. However, as I drove past Tony Zak, the fire dept. building, I noticed it was all in the shade, making me hesitant. After socializing at the mail shack for an hour or two, talking to neighbors on finer points of snowmachines, (the Alaskan term for snowmobile) I noticed the sun was getting higher in the sky. I went back to the Tony Zak building, after returning some library books (this is a community center with a library as well as the FD) I got to work. The sun popped out and I was able to get some work done, My hands didn’t get all that cold despite the snow and colder weather. Painting there reminded me of spring skiing! Well I hope you enjoy this painting as much as I did making it! This entry was posted in Antique Autos and tagged art for boy's room, fire department painting, fire truck art, painting for boy's room, painting of fire truck, plein air, scott clendaniel on October 17, 2012 by realartisbetter.